Ben and Kyle Collins took first and second place respectively this past weekend in kart racing. 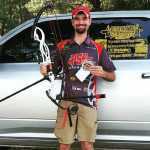 Dalton Vaughn of Lepanto won the C Open State Archery title this past weekend in Donaldson. The Marked Tree Indians senior high cheer squad recently competed in cheer camp in Hot Springs. The Fat City Angels 12U won the World Series title this past weekend in Orlando, FL.